A hot topic with our clients is how to measure the overall impact of marketing dollars. In today’s increasingly complex marketing environment, who can afford not knowing what is working and what is not in terms of the ROI on each precious marketing dollar? Unfortunately, for a long list of reasons, very few business schools have what we would consider to be an effective “marketing attribution model.” Effective, in this case, means that all the marketing dollars allocated toward individuals from the top to the bottom of the funnel (to enrollment) are systematically and reliably tracked and correlated with individuals throughout their “journey” down your funnel. In other words, you know, with data, which marketing activities (and their related costs) specifically had the greatest correlation with bringing that lead from the top of the funnel to signing on the dotted line and attending your program. To be fair, developing a full-blown attribution model is tough to achieve. It requires a typically much more sophisticated interaction between CRM, other marketing software applications and tactics, in-the-field “sales” activities such as information sessions (on and offline), email marketing, digital advertising (PPC, social), SEO activities, remarketing, individual “sales” interactions with recruiting staff, and the many other aspects involved in your top-to-bottom marketing and sales program. In fact, in many cases, the attribution between digital marketing and lead generation—the first step in the attribution process—is either not calibrated properly, driven by misperceptions (e.g., getting a lot of clicks means the lead generation strategy is working), or simply not well-conceived and built to be effective. 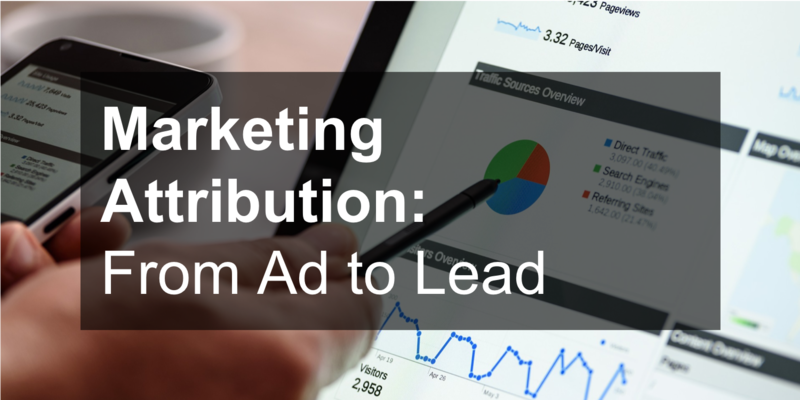 Our recommendation on this whole issue of attribution, then, at the very least, is to begin with getting this essential first step of accurately connecting the dots between advertisement and lead (presuming, also, a high-quality lead) right, as the first focus of your ongoing mission to ultimately have a top-to-bottom marketing attribution system. So, how do you this? Before we get to our approach, let’s walk through a sample customer path to illustrate the point. Below is an example of a small portion of a prospective student’s digital journey through the decision process. Let’s call him Charlie. Charlie is looking for a master’s degree to further his career. He does a search for master’s programs. He clicks on a search ad for Business University. On the landing page, he reads about the different programs, then exits the page. Throughout the next week, Charlie does not search further for programs, but he sees display ads (remarketing) for Business University on websites he visits. Charlie decides he wants to learn more about Business University’s MBA, so he makes a search for “Business University MBA.” He clicks the search ad for this keyword and submits a form for more information on the MBA program. So, which ad caused Charlie to submit a lead? They all had an influence on his decision. The first search ad brought awareness to Charlie, the remarketing display ads kept it top of mind, and the final branded search directed his intent to submit a lead form. When Charlie submits a form, how do we know which ad led him to take action? After all, he was exposed to several ads over his journey (sometimes called ‘touchpoints.’) This is a complicated measurement for any institution to calculate, especially in the higher education space, where the nurturing period for prospective students can be a long one. 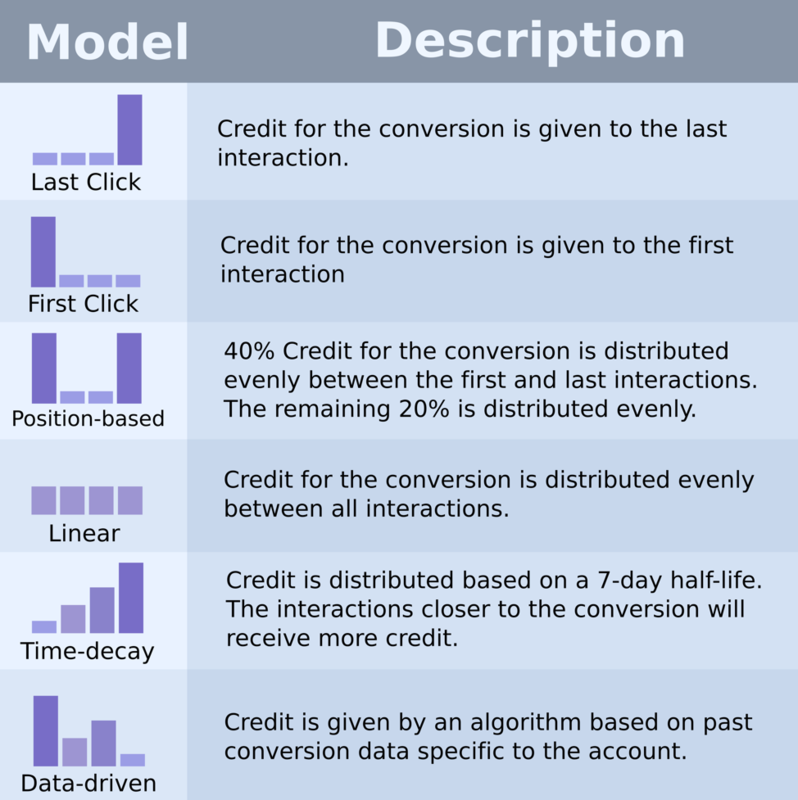 Historically, the most commonly used model is “last click.” Google is constantly generating new, more complicated models using machine learning algorithms to distribute credit for conversions (such as the data-driven one), but these models have shortcomings. For example, they require an account to have a fairly large number of conversions and a large volume of data in order to draw credible insights. Also, like all models, they do not assess data, integrated and correlated across campaigns and platforms. At Eduvantis, we use last-click attribution for most of our clients. We believe it provides the cleanest, easiest attribution, and allows, at the moment, for the best ability to accurately reflect—and to parse out—cause and effect. However, we always discuss a preferred attribution model at the beginning of every engagement and, where it makes sense for certain clients—depending on the complexity of a client’s account, goals, tracking, and CRM—customize a shared attribution model to better count fractions of conversions across different keyword searches, devices, platforms, and dashboards. What is most important for every school is that attribution is taking place accurately and, no matter which model is chosen, that it is clearly understood and agreed upon. (And that the data is then used to enhance marketing strategy and decision-making.) If you feel like you are not currently attributing leads correctly (if at all) and it is impacting your ability to see what is truly working and what is not with your digital marketing, please feel free to contact us to set up a conversation. We have helped many institutions conquer this challenge and get started toward the path to full attribution.